(CNN) - Julia Pierson was sworn in Wednesday as the first female director of the Secret Service in its 148-year history. She took the standard federal oath administered by Vice President Joe Biden with President Obama holding the Bible in the Oval Office. 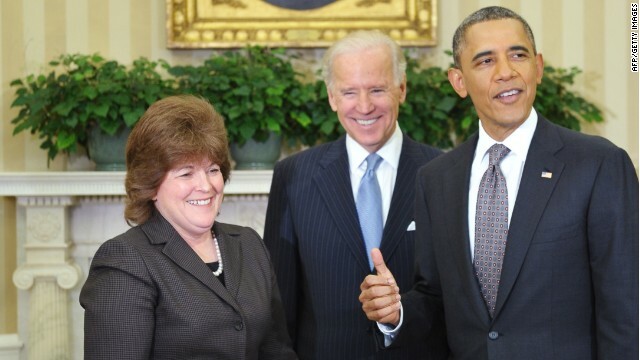 "As Joe Biden pointed out, this person now probably has more control over our lives than anyone else, except for our spouses, and I couldn't be placing our lives in better hands," Obama told reporters after the swearing-in. Pierson has been the chief of staff to the director since August 2008. Her 30-year career began in 1983 when she served as a special agent in the Miami field office. In 2000 she was promoted to special agent in charge of protective operations. She will replace Mark Sullivan, who retired in February. "Julia's reputation within the service is extraordinary. She's come up through the ranks, she's done just about every job there is to do at the Secret Service," Obama said. "Obviously she's breaking the mold in terms of directors of the agency." Pierson takes the reins amid criticism that the president hasn't been appointing enough women to top leadership posts in his administration. She'll also be taking over shortly before the Department of Homeland Security's Inspector General's office releases the third leg of its review of a Secret Service scandal last year, when agents brought prostitutes to their hotel in Colombia while preparing for a presidential visit. Bill Hillburg, a spokesman for the inspector general's office, said a report on the culture of the agency will be released this summer, perhaps around-mid June. This follows two investigations on what happened in Cartagena and how the agency handled the aftermath. Republican Sen. Chuck Grassley of Iowa released a statement saying the Secret Service "lost the trust of many Americans" after the scandal and said he hopes Pierson can succeed in "restoring lost credibility." Ralph Basham who headed the Secret Service from 2003 until May 2006 and now works as a partner in the Command Consulting Group praised Pierson as a good hire. Asked if her selection could be used to fight what some view as a culture problem at the Secret Service, Basham replied, "I am not convinced nor do I believe the service has a cultural problem. As I have said in the past, there are some individuals who have done some stupid things. I can assure you Julie has the ability to make any corrections needed and I think she'll be a strong leader." Former Secret Service Agent Dan Bongino, who ran for the U.S. Senate as a Republican in Maryland last year, gave Pierson high marks, saying she's "more than qualified" and has touched "every operational outfit" in the agency. "The Secret Service is a unique job. I hate that word. Unique. Very overused word. In this case, perfectly appropriate. Nothing like us," Bongino said Wednesday on CNN's "Starting Point." "There is no other operational security element anywhere in the world that uses the kinds of assets the Secret Service does," he continued. "She knows what it's like to stand out there on the long hours on the road to miss birthdays and holidays and really understood the trials and tribulations to the average rank and file agent. I think she will be terrific." - CNN's Ashley Killough and Carol Cratty contributed to this report. if she is that good can we put her in charge of protecting our diplomats overseas? it sure seems like nobody else in the obama administration has any interest in it. "if she is that good can we put her in charge of protecting our diplomats overseas? it sure seems like nobody else in the obama administration has any interest in it." That argument didn't get Romney elected. Why waste your breathe? It sounds really petty to keep resurrecting it. Whatever happened to all of that Republican patriotism that we saw throughout the Bush administration? Many more Americans died overseas in isolated attacks of terrorism under Bush, and Democrats didn't demonize the Bush administration because it occurred. just askin: By your reasoning, GW Bush and Co didn't give a flying eff about our country when he ignored not only the Clinton transition's team warning about bin Laden, but the August 6, 2001 memo stating that al Qaeda was determined to attach our country using planes. Congratulations to Ms. Pierson, sounds like a well-deserved promotion earned the old-fashioned way, by coming up through the ranks. On a lighter note she appears to have the additional adavantage of a secret stashing place for her "piece" with her unique hairstyle. Good luck to you Ms. Pierson. Its about time female get voted in the seats, in the white house you go julia. Obama you made a good choice. The Right enjoys the fact 4 of our people died. Nothing else explains this obcession. Its pathetic. Love Dominica Mama for Obama's comment! "The Right enjoys the fact 4 of our people died. Nothing else explains this obcession. Its pathetic." Well, more accurately, they enjoy that four (4) people died while a Dem was POTUS. You can't even get them to admit to the tens of people killed in embassy attacks while Dubya was fumbling.